Our proven local SEO results and local SEO experts can optimize your site for the most saturated local business results. Get local search optimization for your business and stand out from the competition. According to Google, “near me” searches are up 148% year-over-year and 88% of those searches happen on mobile devices. If you want to attract these local mobile consumers, the time is now to optimize your location-based marketing for your local business. Check out our affordable local search optimization plans, read about other SEO pricing plans or get a free quote. Would Local SEO Benefit Your Business? Are Google Map Listings the First Results? 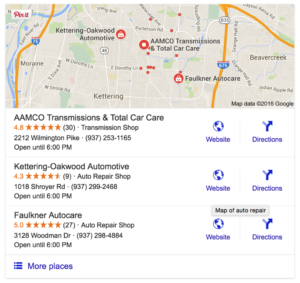 When you search for keywords related to your business, do Google Maps listings show up first at the top of the page? If so, then Google is returning local business results before general websites and you need Local SEO. If your company sells products or services locally or within a service area(s), then our Local Search Optimization plans will promote your business online within those specific regions. Businesses with more than one location can find it difficult to optimize a business for multiple locations. Our Local Search Optimization plans will boost each location in that service area to generate equal improvement. Do You See Your Competitors Above You in Search Results? If your competitors, especially their business locations, show up at the top of local Google listings for your targeted keyword; then you need Local SEO to compete. We have helped many businesses get found on top of Google maps results. Use our free business listing scanner (Free Local SEO Tool) below to scan your business location and see whether you need Local SEO. Enter your business name, street address, phone number, and zip code to scan business listings across over 100+ business directories and social media apps. Why Is a Google Maps Listing Important? As you may have seen in your own searches, getting found on Google maps is critical for a local business. Google often features Google maps listings first above the organic search results. How does Google determine what to feature first? Google looks at the business information, not the company’s website, the business information that it can find across the internet. Local business directories, such as Local, Yelp, EZlocal, Foursquare, and many others are like virtual phone books. These local directories have thousands of users and as well as millions of businesses that they have listed on their sites. Google then compares the data it receives from each of these sites and ranks your business. Most customers find they are listed in the top 3 local listings within a few weeks. Our local search optimization packages include being featured in over 100 local directories and mobile apps that people use every day to find local businesses online. All of these listings collectively communicate to Google that you have a local presence online, causing your location to be featured more prominently. How Important is Local SEO for Your Business? Is local search optimization important for your business? How do you find out? One way is to find out if Google is featuring local businesses, or businesses found in Google Maps, first over general website results. The Google Maps listings are generally shown with an icon on the map highlighting the business name, address, phone number, and reviews if there are any. If Google Maps results are shown first, then you probably need a local SEO plan for your internet marketing strategy in order to rank higher than your competitors. However, it’s important to consider the type of business as well. Some companies are a natural fit for local search optimization services. There are many other types of businesses that need local optimization from a local SEO consultant, but most businesses don’t know where to start with local SEO or how important it is to their business success. Contact us today to find out how we can boost your local business through our local SEO company. Service, such as Plumbers, Cleaning, Janitorial, Painters, etc.